As an inbound agency, it’s easy to tell you what we can do – website design, content creation and more – however, it’s not always so simple to define what we don’t do. This isn’t a matter of inability (hence why I say “don’t” and not “can’t”); rather, it’s providing you the bold strokes needed to bring results. Here at Bluleadz, our mantra is “Helping clients grow their businesses.” Although broad, we do exactly that. We accomplish growing your business by utilizing inbound best practices to increase visitors and leads to your website over time. This influx provides more contacts to you so you can [ultimately] close more sales. That said, we don’t close sales for you, but we can rate leads and provide you the tools to succeed in the sales process. Understanding this delineation of can vs. don’t is a vital component to working with an inbound agency. We inbounders have a mission to do right by your website traffic and contacts. This is why we use smart goals and develop a targeted strategy to meet (and hopefully exceed) the numbers every single time. In order to deliver on our promise, we rely on this tried and true approach. 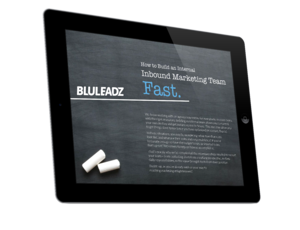 We collectively have decades of experience in inbound, and know a consistent strategy brings results to the table. It’s when we stray from these lead-generating tasks that cause issues and inevitably lead to the dreaded bottleneck. Nobody likes hearing the word “no.” It has an inherent stench imbued in us from an early age. No, you can’t have that cookie. No, you can’t stay out past 9PM. No, those shoes are too expensive. Despite this, it’s important to understand saying “no” is the best thing an inbound agency can do for you. This shows an agency has the fortitude and knowledge of what brings results vs. what doesn’t. It also means you have a solid partnership, where you’re willing to learn and understand why. That’s both monumental and integral for long-term success. You hired an inbound agency to provide expertise on what will bring more visitors and leads, so if we’re saying no, there’s a valid reason – just like there were valid reasons you couldn’t have that cookie or stay out late as a youngster. Saying no not only gives us the breathing room to accomplish the strategy we’ve set out for you, but it also holds us wholly accountable for bringing the results we’re promising. Our goal is 100% transparency with you at all times, so know most inbound agencies aren’t going to accomplish the above. It’s simply not in the scope of effective inbound. Trust me, hearing “no” isn’t easy to swallow, but it’s a necessary evil in order to understand how an inbound agency partnership functions. In your quest for the right inbound partner, being aware of your expectations in conjunction with what an inbound agency can do will make everything that much more seamless. Also, make sure you go with an agency whose culture and fit melds in with your own; this will garner the best probability for success. Thanks for sticking around to the end, friend! Feel free to reach out to me on Twitter or comment on this blog if you’d like to continue the conversation.